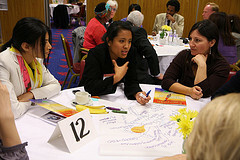 On the second day of the ELC we had the World Café session. This report outlines the purpose of the world café, the structure and content of the session in accordance with the title of the conference and finally, a brief assessment of the session. The World Café is one of the few opportunities for structured interaction amongst ELC participants. As most of the conference entails the absorption of content from the prolific speakers, it is a good opportunity to find the necessary balance with which attendees can express their own feelings on the topics covered. On a more personal level it is also a fantastic way to invoke more critical thought on the themes of the conference that aids the internalisation of content. 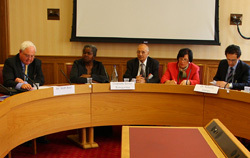 The Human Rights, Torture and Sexual Violence session was chaired by Lord Tarsem King of West Bromwich and Margaret Ali, Director of UPF - UK. The chair, Lord Tarsem King opened with a shocking reminder that innocent women form a large proportion of torture victims, with violations mostly being fueled by greed. 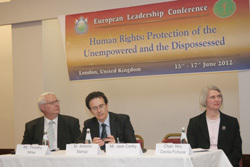 Cecilia Fortune, WFWP South London regional director, chairing the seventh session of the conference, began by expressing the necessity for a common understanding of value, especially that of human value. 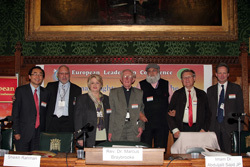 Jack Corley, Chairman of UPF in the UK and an adviser to UPF Europe, explored this topic whilst sharing the perspectives on human value and dignity based on the core principles of UPF. He challenged that if one man’s meat is another man’s poison, then how can value be determined? The value of a material object, he explains, is determined by the respect you have for the person who gave it to you – a piece of paper with writing on it gains value if, for example, it is adorned with the Queen’s signature and handed to you by her yourself. Alternatively value can be attributed to an object based on its purpose. If the object fulfils the role for which it was created it can be considered meaningful, and therefore valuable. Indeed, the question of ‘what is value’ must be addressed on every level. Do We Have to Tolerate Torture?